WU071 (Black) by Solene at coachfactoryoutletion.net. Hurry! Limited time offer. Offer valid only while supplies last. Product Structure: Turn-lock, Zipper Closure, 1 zipper pocket & 1 slip pocket inside. Adjustable Shoulder Strap Drops up to 29.5"
Style: This Stylish Multi-functional Cross-Body Bag is the perfect everyday activity. 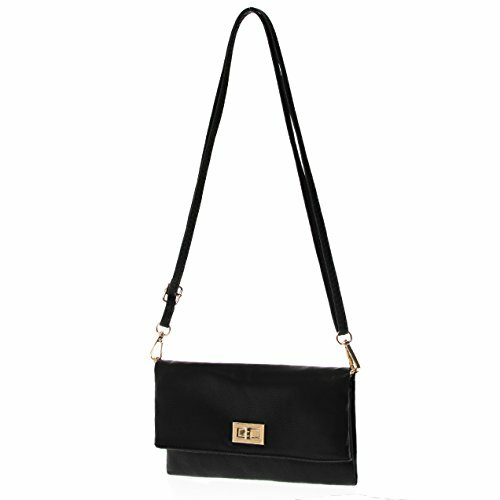 You can carry it as a cross-body bag with the strap available or single shoulder bag. Occasions: Perfect size for casual using.SIMPLE DESIGNED,CLASSIC STYLES & AWESOME GIFT IDEA!Perfect size for casual using.SIMPLE DESGNED,CLASSIC STYLES & AWESOME GIFT IDEA! Approximate dimension: 9.0"(W) X 5.5"(H) X 1.25"(D) // Disclaimer: The color you see on your screen might not be an exact color of the product due to monitor settings/pixel definitions/model/brand/etc. If you have any questions about this product by Solene, contact us by completing and submitting the form below. If you are looking for a specif part number, please include it with your message.